Week three has us settling into our (self) designated roles: Lee as Driver/Dumper/Rockstar, me as Navigator/Accommodation Finder/Book Seller and Kai as the self-proclaimed “Boss.” Kate is still putting up with us all and rounds out this crazy crew. As anyone who has toured or traveled much can tell you, the key to happiness and sanity is flexibility. Unfortunately, that directly contradicts the necessary mantra of the Do-It-Yourselfers: control freaks get it done. Finding the balance is my personal quest. I’m better at it with coffee in my system. Luckily, efficiency is my greatest asset and being a mother has taught me to hone that efficiency even more. I do my best to research every stop, chart the quickest safest routes, find fun things to do, and still get all my work finished. We’ll get ‘er done, I have no doubts about that … I just hope not to inspire homicidal fantasies in those around me in the meantime. Austin was our longest stop yet, giving us a full week in one place—enough time for three shows and a quick flight over to Nashville for Lee to get his NACA on. We also had a chance to check out downtown, both for shows and to take Kai to another children’s museum. I’m pretty sure he’s going to see every museum across the country. While Lee was away, Kate, Kai and I took to some shopping and playground hopping, generally enjoying a couple days with nothing official to do. We caught up on some much-needed housekeeping, emailing and girl-talk, and met some of the neighbors. Meeting the neighbors is quickly becoming one of my favorite things. It’s a great way to get to know the area, get tips on parks to stay at, hidden gems to seek out, restaurants to try, and the anthropologist in me loves hearing about how other people live and think. It’s like Forest Gump’s box of chocolates: you never know what you’re gonna get. For Austin favorites, we loved Zen, a Japanese/Texan fast food chain that has fresh meats, fish and veggies ready to cook on demand and make into rice or noodle bowls. You can even get steak sushi, which makes Lee happy. And they carry our favorite chili paste, Sambal, which bumped it up a couple extra notches. 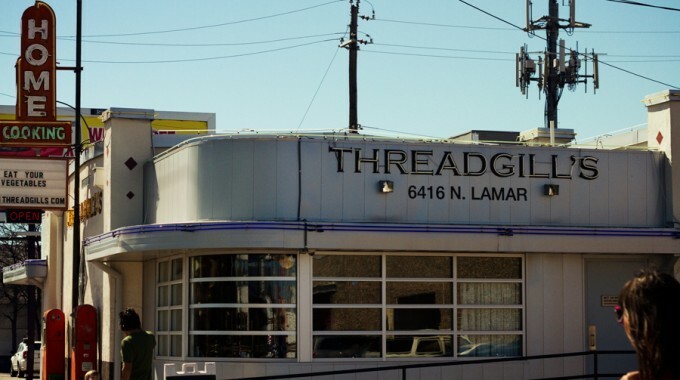 We also tried Threadgill’s, the first Austin restaurant to get a liquor license post-prohibition, and the venue that claims to have broken Janis Joplin. I say claims because we’ve been at this long enough to know no singular thing or venue breaks an artist, but I’ll admit it makes for a better story. It was my first taste of southern food and I rather enjoyed my pecan-crusted chicken with creamed spinach. After Lee finished his meal (and mine, Kate’s and Kai’s) he proclaimed “I’m gonna get fat on this tour!” Good thing a lot of these parks have gyms. Our break time is now officially over and we’ve got a busy week ahead of us as we make our way to New Orleans—an exciting stop since none of us has been before. We’ll spend a few days there and we’re looking forward to good gigs and fantastic food! Anyone with recommendations on things to see or places to eat, please comment/message/facebook/twitter us and we’ll do our best to try it all. This, my first blog of the tour, comes to you from day 5. We are in Flagstaff, Arizona getting rested up for our first show here tonight at Bookman’s. I’m sure that seasoned RVers out there will read some of our itinerary and laugh outright, but we’ve got shows to do and people to see and we will get there! I have to admit, those seasoned veterans may have a point. So far I’ve noticed a few things about life on the road. The first of which is that, despite our mode of travel—which is beautiful and perfect for what we need—it is a ginormous beast that attracts attention. 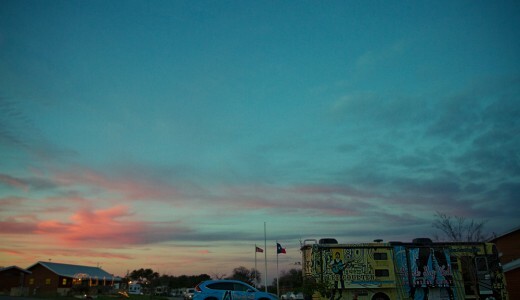 On our first day we saw two looky-loos get into a little fender bender while gawking at our rig! It was at low speed so everyone was fine—no need to worry. We also learned that we don’t take to the road ready to win any races. 55mph is about our top speed and that is only achievable on long straight sections of well-maintained freeway. So we’re keeping a furious pace of morning TV and radio promo spots, evening book/music shows, plus errands, and picking up everything else we’re learning we need on the road: a solution to find constant wifi, snacks, DVDs, extra hoses, etc. And we’re coming to find that there is only so much we can ask of ourselves and of our bus. Hopefully we’ll settle into a rhythm soon and won’t feel like we’re always four hours short in our day. The second thing I’ve been finding is that what we are not doing what most RVers are doing when we stop at RV parks to hook up to electricity and water. I’m not sure exactly how they see us, but its clear we’re foreign. Aside from the staring, there’s the sweet looks at Kai when he introduces himself as Peter Pan, followed by the furrowed brows when they see Lee, Kate and I step off the bus. But then we’re off again, before getting the chance to talk to them and find out. They’re typically retired, slowing down their pace, enjoying the country in a meandering fashion. We’re out early, in late, off quick, and probably leaving behind all sorts of clues that give us away as motorhome newbies. That leads me to my third lesson so far: we can’t do it alone. And thankfully, we don’t have to. Kate Vincent, our merch girl/babysitter/duet-singer, has already stepped up to the plate and saved us multiple times (in just 5 days! ), handling our sales, watching Kai while we do appearances together, sticking it out on the bus so the repair guy could fix a hydraulic issue while Lee and I did a morning show in Tuscon, and then singing “Gray or Blue” on the radio with Lee this morning, only to finish up and take Kai (who got in trouble for yanking on the microphone) out to the lobby to let us finish the interview. If she still likes us by the end of this trip, she deserves a medal. Or a trip to Hawaii. Maybe both. I’m sure there are many things I’m leaving out, either because it’s all happened too fast, or because I am about three days behind on sleep, but they say a picture is worth a thousand words so … check out our gallery and stay tuned for more. TEDx events bring together innovators, explorers, teachers and learners to encourage conversation and collaboration. Their vision is to be a local forum for ideas that inspire people to change their lives and their world. I had the honor of speaking at the TEDxYouth@SanDiego event a few months ago and they just posted the video. I cannot emphasize enough, if you ever get a chance to attend a TED or TEDx event, please do. As one of the other speakers, actor Richard Dreyfuss, said at the same event in 2011, if everyone in the world attended a TEDx event, it would be a much better place. Fun time this morning in San Diego with a radio interview and performance on The DSC on Jack FM and the TV version on CW6’s morning show “San Diego Living”. And see some fun pics by clicking on this pic below.